HARRIS L. ELLIOTT is an associate attorney at GWC. After graduating from the University of Illinois Urbana-Champaign with a BA in Political Science, Harris earned a Juris Doctorate from the DePaul University College of Law. He began working at GWC in 2006. Over the course of his career with GWC, Harris has secured millions of dollars in arbitration awards and settlements for his clients. 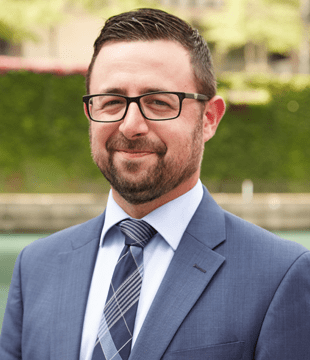 Licensed to practice law in the State of Illinois, Harris is a key part of GWC’s legal team and an active member of the American Bar Association, the Chicago Bar Association, the Illinois State Bar Association, the Illinois Trial Lawyers Association, and the Workers’ Compensation Lawyers Association. When he is not advocating fiercely on behalf of his clients, Harris enjoys a round of golf, fantasy football, and website development.